Clayton is not a very good villain. I'll just put that out there. He's like a lot of other Disney villains: foppish, British, egomaniacal, greedy, impatient. 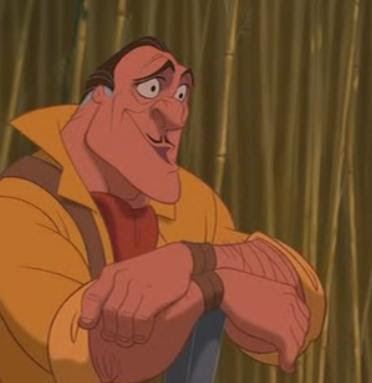 You could sub in Ratigan or Governor Ratcliffe and there'd be no real difference. All he does is serve as a plot-moving device. 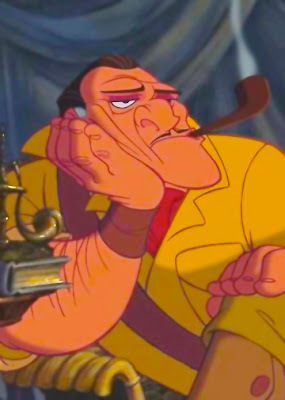 In fact, in the original novel, Clayton is Tarzan's friend. Because the story is really about Tarzan's identity crisis. Fine, more detail. 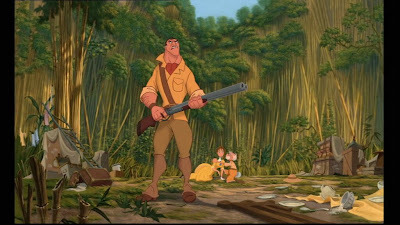 He accompanied marshmallow dad and British chippy so he could hunt down some gorillas, presumably to mount them on his wall or sell them, providing a paper-thin motivation for a bad guy. Why did Professor Porter even bring him along? What did he think Clayton was going to do? 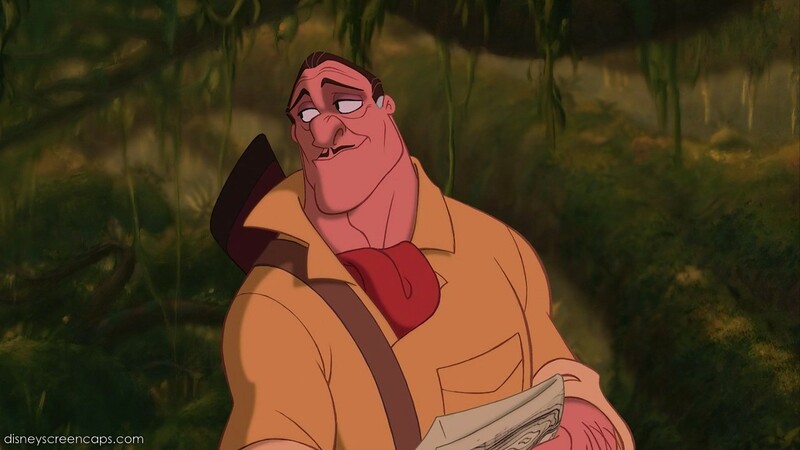 Character Strengths: He definitely doesn't have the look -- his clothes and his mustache are ridiculous. Like the evil "Man in the Yellow Hat" from Curious George. 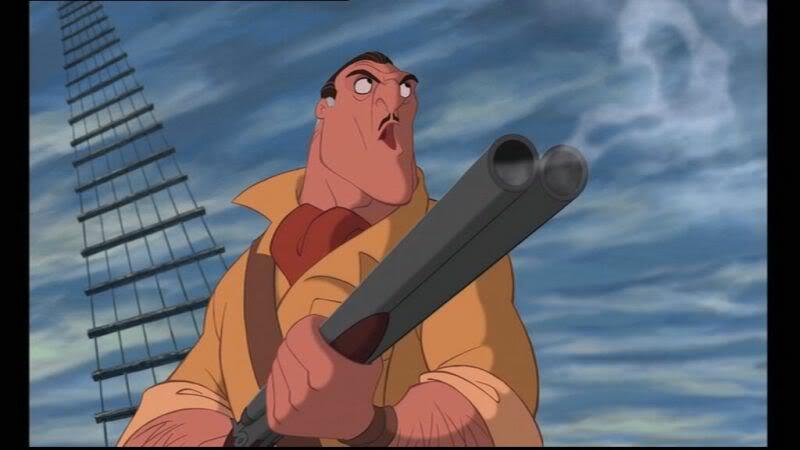 You might count that he gets the ship's crew to commit crimes like kidnapping and poaching. I don't know if they were always in his pocket or he suddenly coerced them at the last minute. This goes back to what I said about Clayton being a plot-moving villain. Evilness: See Amos Slade regarding hunting. I don't get it, but I don't mind it, as long as you're safe and hunting within the law. By today's standards, what Clayton's doing is morally wrong, but was it illegal for his time period? Were gorillas an endangered species? Of course, the original novels were quite racist, violent, and full of misinformation. So there's no way to win here. Tools: He's got a gun? It is a big gun. Complement to the Hero: There's a very strong dichotomy here, where Clayton is presented as sophisticated and Tarzan as an animal. 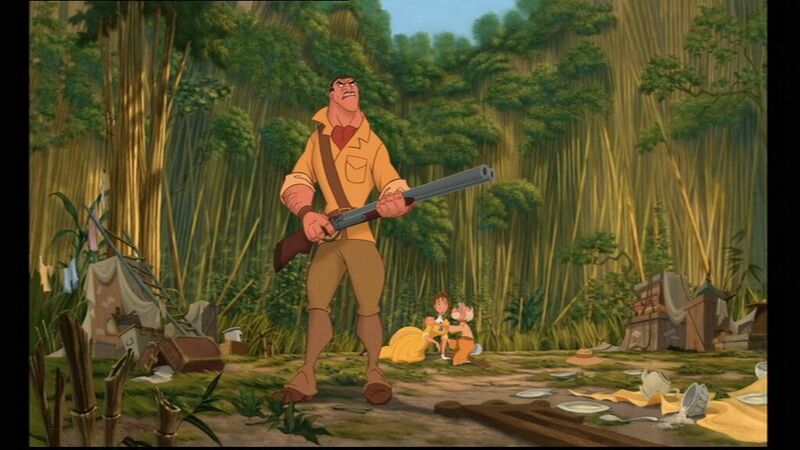 Except that Tarzan proves he's more of a gentleman than Clayton, and Mr. Mustache devolves into primal rage. 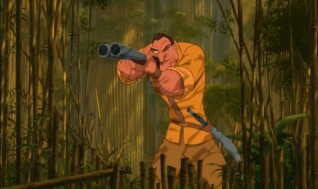 I have a strong affection for themes about the duality of man, and that's part of Tarzan's enduring charm. 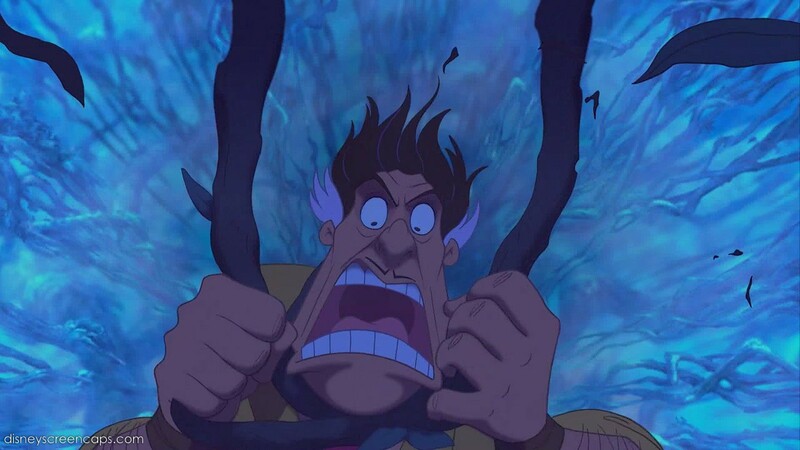 I also love that it's Tarzan who creates, by his own regretful volition, the Act 3 conflict that breaks everything. 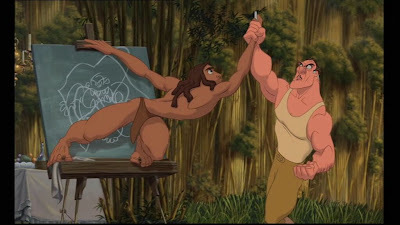 And in the end, Tarzan refuses to kill and be a "man" like Clayton. He wouldn't be part of any club that would have him as a member. Fatal Flaw: In the big climactic battle, we see the true differences between the hero and villain -- what makes a monster and what makes a man. I would say Clayton's biggest flaw is letting his desire get a hold of him, turning him into the rageful beast he purports to rise above. I'm sure I'll be reusing this paragraph when I get to Gaston. 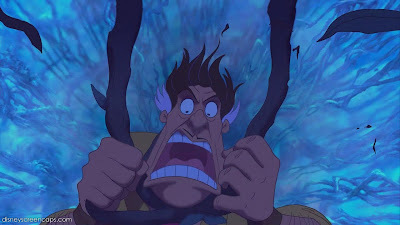 Method of Defeat/Death: It's actually fairly gruesome for a Disney movie, even if its only in shadow/semi-off-screen. 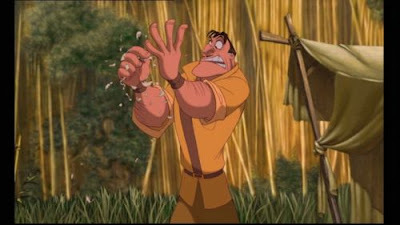 Clayton attempts to fight Tarzan in his own element (the vines) and gets knotted up. In his rage, he swipes his machete, while Tarzan's SkyNET eyes analyze the vine pattern and see what he's about to do. Before Tarzan can warn him, Clayton slices the rest of the vines, except the one around his neck. He falls, and we see the vine yank taut.